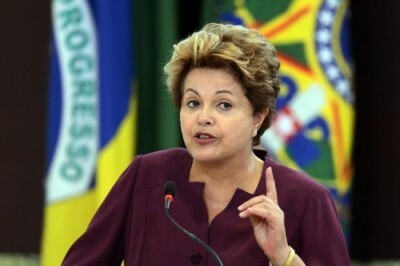 The impeachment of President Dilma Rousseff was an attack on democracy, said thousands of Brazilians marching against the coup government. Brazil’s streets erupted in protest after democratically-elected Dilma Rousseff was deposed as president with 61 votes in the senate Wednesday. 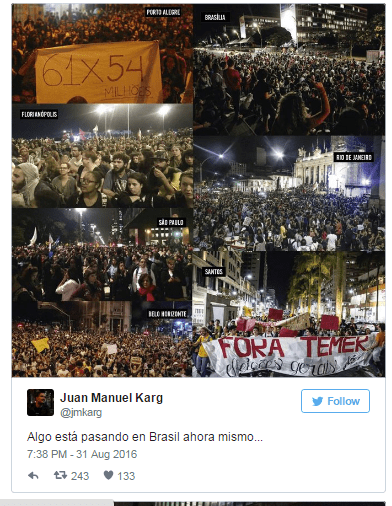 Brazilians marched in dozens of cities across the country, including Sao Paulo, Rio de Janeiro, Porto Alegre, Belo Horizonte and Recife, among others. Police cracked down on the protests, using water cannons and pepper spray to disperse crowds. In Sao Paulo, protesters blocked off streets and highways with flaming barricades to show that their democracy is under attack. Hundreds also gathered at the presidential palace to show their support for Dilma, holding balloons, flowers and handkerchiefs. 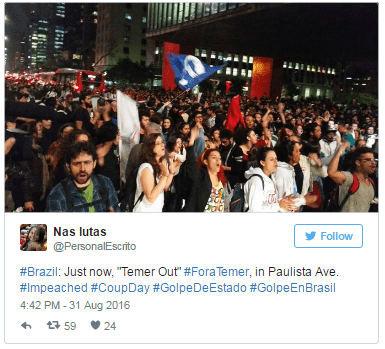 Those that took to social media quickly made the hashtag #ForaTemer a worldwide trend. 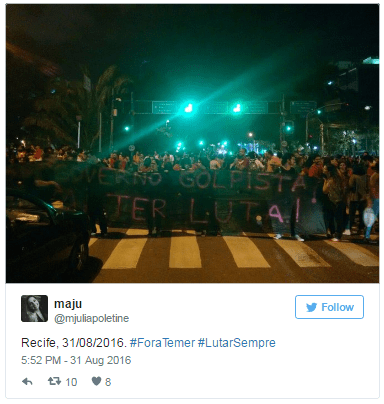 The Twitter account Jornalistas Livres posted a photo of a broken camera, which they said was smashed by the governor of Sao Paulo. The protests were a repetition of explosive marches Tuesday before the vote, where social movements shut down major roadways around Sao Paulo, and Monday, when military police cracked down with tear gas and flash bombs, local media reported. At stake are the public welfare programs and educational programs created and expanded in the 13 years that the Workers’ Party or PT, has governed the country. The vote to remove the twice-elected Rousseff from office hearkens back to Brazil’s dark history of oppressive military rule. In her testimony before the Senate Monday, Rousseff herself said her impeachment would represent the “death of democracy” in Brazil.